For the vintage look shown in the photo, work the outline and creases in the petals using 3 strands from a 6 strand embroidery thread and stem stitch. Using a 2nd colour, work the stamens in 3 strands of thread and stem stitch. Then work the a number of french knots at the ends for the pollen. 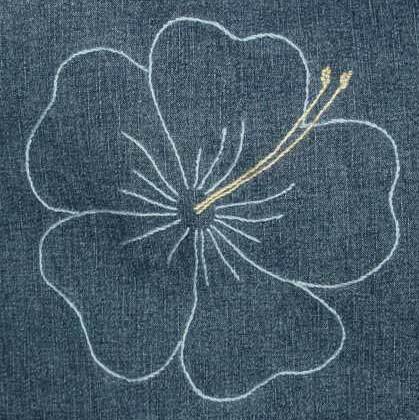 Download the vintage look hibiscus embroidery pattern. Copyright Sarah Bradberry April 2006. All rights reserved.